Easter and Culture War: Identifying the Wrong Enemy? This week I introduce a blogger Justin Tse whose specialty is in the area of geography. This blog reminds me why being a culture warrior is not always a great idea. While interacting with Justin’s original rough draft, another angle occurred to me. Before I talk about it, I totally agree with Justin’s formulation of the Great Commission, but more importantly, his article (please read it) builds a wider narrative from Matthew’s book narrative context. Although Justin is a geographer by training, I wish every Bible major would do what he does with Matthew. We have to stop focusing on the minutia of a few verses and put verses into wider narrative. Why is the culture war a problem? First, many evangelical Christians are mistaken that culture is the enemy. Biblically speaking, culture is never the enemy. Satan is. So is death. Many have mistaken culture for Satan and death. Surely, some may guess that culture can express values that are Satanic, but do I dare to say that orthodox faith also does so? This brings me to my second point. Second, have we notice that Jesus’ primary enemies were the religious people? While Jesus explicitly cast out demons quite often in the Gospels, his primary attackers were not demons. They were the religious people. I dare say that the enemy is not only external to the church. Society should not be expected to behave like Christ or to buy into Christ’s values. Rather, the real problem exists within the church also. No Christian has ever declared war on the church but perhaps some ought to. On this resurrection Sunday called Easter, what does the culture war have to do with what is external and internal to the church? The death and resurrection of Jesus had changed some things, but some things would remain the same. Having written a commentary in Chinese on Acts, I can guarantee that the same opposition Jesus experienced became the opposition to the church. The societal culture would inevitably clash against the church. The clear manifestation of Satan also occurred in Acts in the same way as in Luke’s Gospel. Satan remained the enemy who actively opposed the work of the disciples. Yet, we do not see the disciples actively opposing and fighting the society. They could critique it in their dialogue by using language society understands (e.g. Acts 17), but never directly went against it. Society and culture were never the enemy. What then changed after Easter? People changed. Peter who denied Christ three times spoke up repeatedly for Christ in spite of persecution and grave threats to his life. Even Paul had changed. He formerly persecuted Christians but now became Christ’s biggest spokesman. The entire Acts narrative is an illustration of how Easter (and subsequent Pentecost) had changed the world through changing the community of faith. People change. As a result of this great change, society would see the changed community and see the power of Easter. This change includes not just individual life changes but a continuous process of house-cleaning (e.g. Acts 5). Why do some people think that the culture war is a good idea? It is because they find it easier to point finger at the society. Society is going to do what society is going to do. Sometimes society does amazingly wonderful things. Sometimes not. That’s the way things go. It is easier to point finger at society, but with one finger pointing forward, there are always three fingers pointing back at ourselves. Critique of the church is never easy or fun, but Easter demands a self-critical approach to life in faith community. Right Texts Wrong Meanings Blog for Lent: After Palm Sunday, then what? The passage of Mark 11.20-26 is quite a puzzle. I have covered it in my new book already, but I wish to use it as a meditation for Palm Sunday. Shortly after Jesus entered into Jerusalem, he saw a fig tree and condemned it even though it was not the season for figs (11.13). The poor fig tree! This is one of those puzzling acts Jesus did that have no sure answers. Thereafter, Jesus cleansed the temple (11.15-18). Finally, the next day, the disciples saw the dead tree and was astonished. I wish to focus our attention this Palm Sunday on 11.22-24. Jesus taught that they had to have faith in God (or “keeping on believing” or “keep on being faithful to God”). The verse 11.23 is very strange in that Jesus used a hyperbole about a mountain, not just any mountain, but THIS mountain. Jesus evidently was talking about the temple mount. Jesus used the teaching not as a teaching about prayer but about the fig tree and the temple because the context was to answer Peter’s query about the dead cursed tree. Jesus’ teaching was a prophetic pronouncement about the temple having lost its place, evident in his previous clearance of it. Since the temple has lost its place as a house of prayer (11.17) and became a den of brigands, Jesus would build a faith community that prayed. Yet, he did not build it immediately. Why did the disciples need to remain faithful or have faith? The reason Jesus taught about faith was not just about asking for anything including something outrageous as throwing a temple mount into the sea. Jesus’ teaching about asking for anything only came after the building of meaningful relationships. Evidently, the temple might have lost its relational function as well when the money and doves became means of financial transaction rather than relational building. Thus the story here tells us that the faith community Jesus created would have enough faith to challenge its own in the way Jesus did, by saying that the mountain ought to be thrown into the sea. On the more positive side though, it values relationships rather than transaction. Such a community would not sit back comfortably and relax because after saying such pronouncement, Jesus was crucified. After Palm Sunday, crucifixion happens. I wonder if the church community today characterizes Jesus’ spirit enough to warrant crucifixion. This too deserves consideration. 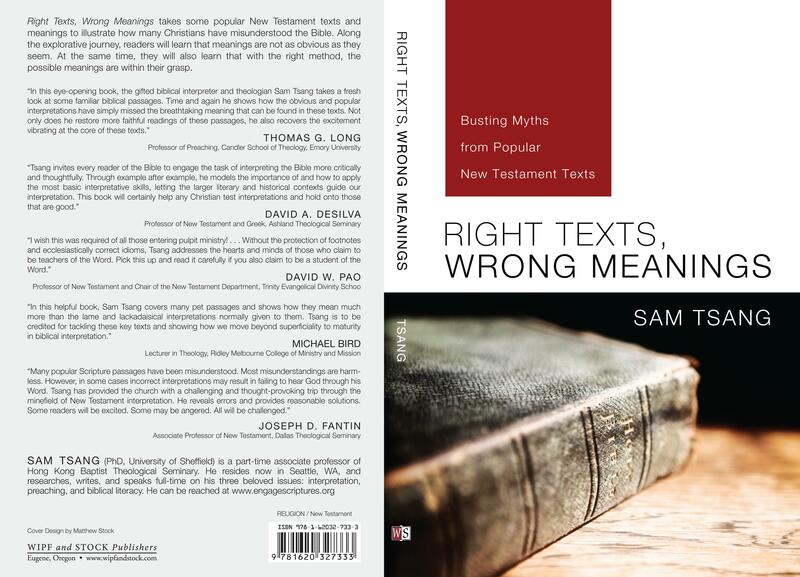 I’m happy to announce my new book, Right Texts, Wrong Meanings: Busting Myths from Popular New Testament Texts, by Wipf and Stock. After writing twenty some odd books in Chinese, I’ve finally broken down and wrote something in English. This book takes some of the popular NT texts and examine them for what they are. Here’s a little test that won’t affect your grades unless you’re taking a class from me. Did Jesus REALLY say not to judge or you will be judged? Did Jesus really say to ALL those who were weary and burdened to find rest in him? Did Matthew 18 really contain a promise about when two or three are gathered in Jesus’ name, he is among them? Did Romans 8.28 really say that all things would work out? Was “lukewarm” referring to the spiritual temperature of the church in Revelation 3.16? If you answer with a resounding “Yes,” you need this book because you’ve just flunked the test. The resounding “Yes” answer is an indicator that you’ve bought into what I call “pop Christian cliches” and there’re plenty of those floating around pews and pulpits alike. I’ve been convicted to write this book after teaching preaching and the NT in academia for more than a decade and after preaching in all the continents for more than two decades. The cliche-driven faith I see among evangelical is alarming. All beliefs have consequences. Some consequences are greater than others. If someone has to be the bad guy, it might as well be me. Originally, the subtitle of the book was “Lies Your Sunday School Teacher Taught You,” but my publisher did not like the “Sunday School” idea and some people thought it was too arrogant and controversial. So, we bust myths instead. The best way to read this book is to first guess what each passage actually means before reading. Don’t read for pet answers. Read for understanding of the thought process required to discern right from wrong meanings. I shall blog about each chapter shortly after Lent but the blog of course will not be the content of the book. Stay tuned and keep following my blog. Instead, I’ll talk about the making of this book and the consequence of answering “Yes” to all the above questions. The book also has small group discussion questions that are biblically-based, after every chapter. If you or your small group wants to follow my blog to supplement your discussion, you’re also welcome to do so. My study questions in the book will both stimulate your interpretive skills and your spiritual formation. If you wish to purchase this book, feel free to take advantage of the web price right now. It won’t hit Amazon until about a month or so. This price will probably be better than Amazon’s. Click here. As you can see the book is well-endorsed by the luminaries of the New Testament and preaching worlds. I’m sure you will not be disappointed. After blogging about the making of the book, I will probably start a series of myth-busting blogs of other cases of misinterpretation. Some of these are by famous pastors and even theologians. I’ll bring examples straight out of my reading as I write my other books. Of course, I’m going to withhold the identity of the guilty, but you’d be surprised that the kind of crazy interpretation is more common than you think, not just in your local Bible studies but also among “famous” pastors etc. I’ve already found a lot of examples, enough for at least several months. You can also have your say and suggest more passages for me to discuss. Stay tuned.